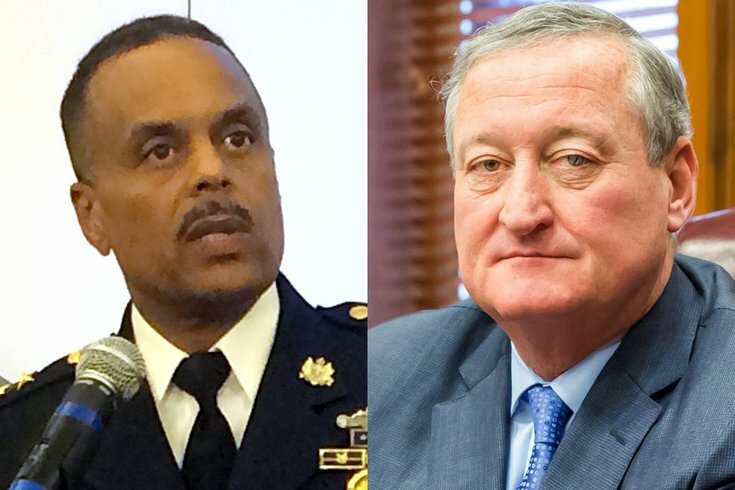 Philadelphia police Commissioner Richard Ross, left, and Mayor Jim Kenney apparently view the Starbucks incident with differing perspectives. Ross said his officers did nothing wrong; Kenney called the incident "a case study in racial discrimination." When it comes to the controversy over two black men being led out of a Center City Philadelphia Starbucks in handcuffs for the offense of being there in the first place sans lattes, there’s one unavoidable takeaway. Nearly everybody involved – both at the store on Thursday night and in central-casting reactions from all corners of the outrage spectrum – was in the wrong. First and foremost, it applies to the manager who called the police on men who were waiting to meet a friend. It also goes for the company which instituted a policy that enabled her to do so, even though everybody knows that humans – generally, white – often loiter inside the coffee empire’s locations with an eight-hour coffee to tap into the free WiFi. The men who declined to leave when apparently (hopefully) asked to do so? Right not to make a scene, but wrong not to defuse the situation by merely ponying up $1.85 for a tall coffee. Also in the wrong is the damage control-fueled CEO. Issuing an apology was a justifiable response. Not realizing that this policy could lead to situations like this was an inexplicable blind spot. It doesn’t take a corporate titan to realize putting front-line employees in an inevitable position of becoming the face of a tinderbox-activated racial dustup is not a good look. The protesters who took over the location over this weekend? Voicing displeasure with what happened is an American tradition. An unwillingness to engage in a “dialogue” with the apologetic company until the manager gets fired is a faulty red line that will accomplish nothing. In doing so, they're putting a fall gal on the unemployment rolls. The knee-jerk reactionaries who cling to their deliriously unrealistic “don’t do anything wrong and you won’t have to deal with police” worldview help even less than the protesters’ red line. They represent the “don’t bother trying to engage in thoughtful discussion” guild. They know not that this isn't how things work in the non-lily-white real world. Mayor Jim Kenney was wrong to send a message to his nearly 50,000 Twitter followers – a message tailor-made for the countless stories about the incident – with an “at least based on what we now know” caveat. His is a position that relies on knowing before speaking. Police Commissioner Richard Ross was even more wrong to instinctively have the arresting officers’ back in a Facebook video featuring a caveat of his own: I totally get implicit biases, but we train our officers about that. Doubling down, he referenced that time an officer wasn’t permitted go potty at another Center City location because of that rule. Really, commish? But for the saving grace of charges not being filed against the duo, this isn’t a good look for anybody involved. What is a good look is nobody involved in this maelstrom of missteps in Philly wanting to see it happen again. There is a cloud obscuring this silver lining, however: the fact that Kenney and Ross appear to be looking at the incident from irreconcilable perspectives. Having both weighed in quickly – a must-do in instantaneous-reaction America – Ross totally championed his officers who cuffed the Starbucks duo while Kenney totally championed the mindset that this incident is a case study in racial discrimination. Well that’s all well and good until you realize that Ross already had the officers' six, publicly declaring that they were just doing the job they’re paid to do. (On that, he's right, even though better cops would've, at a minimum, spared the cuffs). 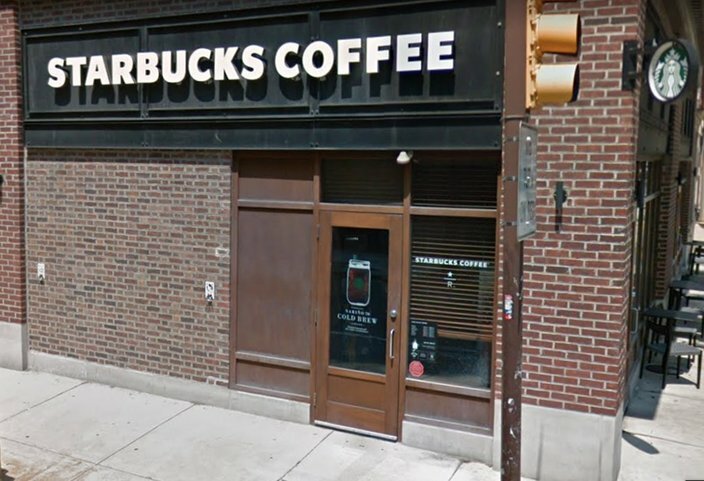 The Starbucks shop at 18th and Spruce streets in the Rittenhouse neighborhood of Center City Philadelphia. Have much faith in the police team’s “review of their policies moving forward” making any sort of difference? If you do, that makes one of us. Sure, Ross was right insofar as officers responded to a call from a store manager abiding by company policy. As long as that policy remains, the calls to 911 could continue. It's almost as if Ross fast-forwarded through the video, didn't consider the optics and scribbled out a "all cops are good as is following orders to the letter of the law" script to avoid a feud with the Philly FOP. Elected, appointed and corporate officials will continue to posture and pretend that they're totally listening and that there's even a tiny chance that things like this won't happen anymore. Maybe they'll even talk to one another first before issuing their conflicting statements. Wouldn't that be nice? All the while, people will still be able to get the keys to the bathroom inside a private business solely by purchasing an item at the register.